Designed as a low rise, Corfiot-style village, the resort houses comfortable, well-appointed rooms and suites in 22 blocks surrounded by pretty gardens. There are 4 freshwater swimming pools for both adults and kids. The beautiful St. George South beach is easily accessible and a great array of restaurants, cafés and bars are also available nearby. The thrilling rides and slides of the in-house water park will enable children and adults to have fun. 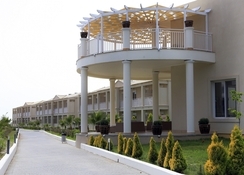 Those looking for holidays in a sandy beach with a variety of services, facilities and fun-filled activities in a laid-back atmosphere will find Aquis Sandy Beach Resort fully satisfying. The golden sandy beach of St. George South is right on the hotel's doorstep and Agios Georgios is barely 200 metres away. Corfu town lies 30 km away while the Lefkimi town is 15 m away. The nearest airport LGKR Corfu is only 28 km away. This is a destination ideal for sailing, mountain biking, hiking, windsurfing, water skiing, mountain biking and parasailing. The Aquis Sandy Beach Resort offers an amazing array of cuisines served in buffet and a la carte style. Three buffet restaurants and another a la carte eatery with a panoramic view provide a unique experience to diners. There are two picturesque glass-ceiling buffet restaurants that make the most of those blue skies! 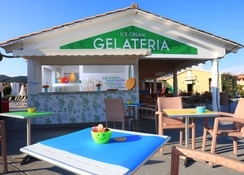 The main restaurant Elia caters both international and Mediterranean cuisine in buffet style. There is an Adults-Only Restaurant that serves buffet breakfast, lunch and dinner for singles and couples. Guests who want to try Italian delicacies can head to the Il Gusto Di Sandy Italian Restaurant. 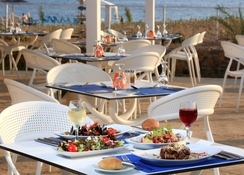 Guests can admire the sea views while feasting on Mediterranean cuisine at the a la carte Seaside Restaurant. The Terrace Restaurant serves light meals and snacks. Guests soaking in the pool can have their drinks served by Just Pool Bar or Navio Pool Bar. The Ammolofos Beach Bar serves drinks at the beach. Those looking for a chilled-out vibe can head to the Thoughts Bar. Three outdoor pools, furnished with sunbeds and loungers are perfect places to take a dip or soak up the sun while having refreshing drinks from the poolside bars. Kids can have a nice time in the toddlers’ pool, and the mini water park that comprises four water slides. There is a mini club with lots of activities will keep the tiny tots entertained. Fitness freaks can head to the fitness centre, while the wellness centre provides pampering spa treatments to those who want to relax and unwind themselves. There is an amphitheatre where interesting animation shows are hosted during evenings. 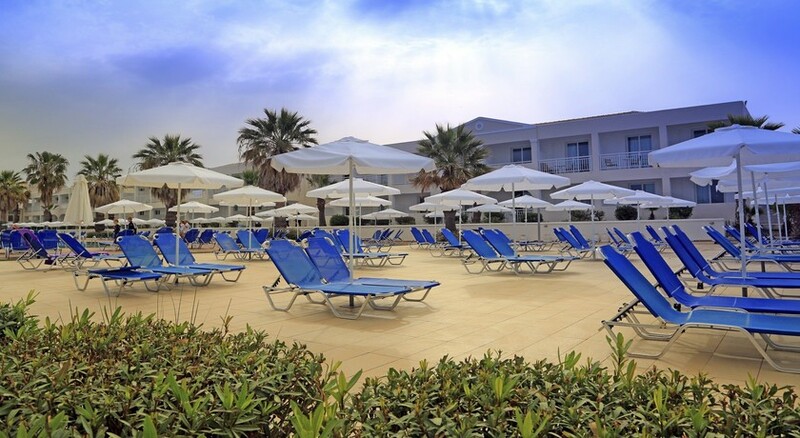 This sandy beach resort in Corfu also provides a host of activities like basketball, beach volleyball, billiards, darts and electronic games for guests to indulge in. You can also try water sports at the beach or simply relax at the beach bar. Excellent second visit many improvements over our first time. Food excellent new owners are making major improvements. Return frequently as always greeted as friends. 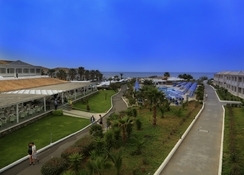 Hotel improves every year and listens to visitors and makes the important issues there for the next season. The main reason for our return is the staff who we stay in contact with all year round. We had a lovely stay at the Aquis Sandy Beach. The children loved the pool and the slides, which were a little tired but clean, functional and supervised. They also really enjoyed the kids club although it didn’t run everyday as advertised. The beach was absolutely stunning and the water clean. The room was basic but clean. Like the pool area it was a bit tired and needed a bit of TLC but it was great to have separate bedrooms for us and the kids. It would have been greatly improved with a kettle! The food was lovely and there was a excellent variety. The children loved the kid’s eating area and there was plenty of choice for them. The kid’s entertainment was good too, the entertainers were very kind and enthusiastic. Value for money but quiet hense a good price at the time. 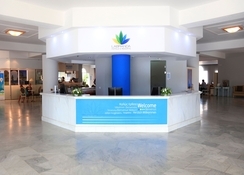 Our was clean and tidy and very dated but the hotel reception and other staff were very polite and helpful. The location of the hotel was quite a way from anywhere and the amount of wasps were an absolute nuisance.